Cayden has always loved to cook! So I decided I would take this opportunity to nourish that curiosity with health! This recipe was so easy, took no time at all and it brings me great pleasure in cooking with him and nourishing our bodies with delicious, easy recipes. I hope you all enjoy, this could be an appetizer, a snack or made into a meal like us! Why not combine my passion with his passion...so tonight we cooked up this yummy little recipe from Quick and Easy Ketogenic Cooking by Maria Emmerich. Heat the oil in a large skillet pan over medium heat. While the oil is heating up, form the beef into 24 small patties about 2/3 oz. (1 1/2 inches across) each. Season the sliders on both sides with salt. Fry the patties in teh skillet in batches, about 4 minutes per side for well-done or until cooked to your liking. 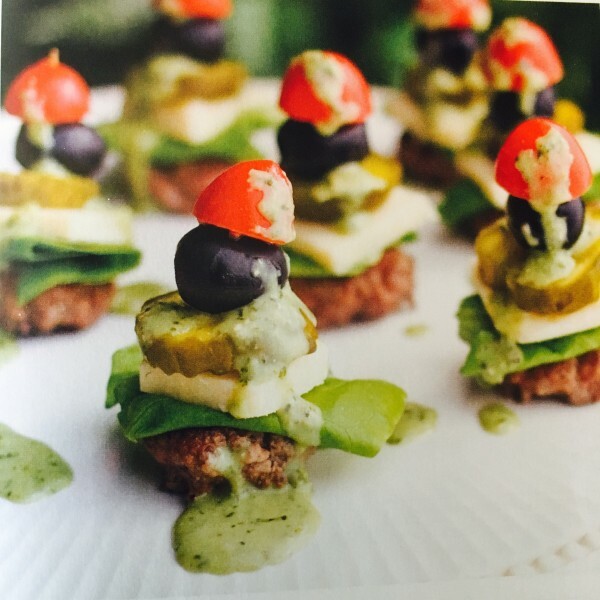 While the second batch is frying, assemble the first batch of sliders: Place a burger patty on a serving platter and top it with a piece of lettuce, a slice of cheese (if using), a pickle chip, an olive and a cherry tomato half. Secure with a toothpick. Repeat for the rest of the cooked patties. If you are like me and made this into dinner, add either a salad or a nice serving of steamed broccoli or another veggie!